Tomorrow is the first night of the two-night BB20 premiere, and more spoilers about what has been going on in the game have been trickling out from our source who was 100% accurate on all counts last season. We may be seeing the show for the first time this season tomorrow night, but the game got underway last Wednesday. So, if Tyler is indeed the first HoH, he's trying not to rock the boat or put a big target on himself by using the competition results as justification for his first round of nominations. But I wouldn't get too upset by this (assuming you are upset by the noms) because there is another whole week of play before we have our first live eviction next week. Someone is sure to put a target on themselves by then by being obnoxious or maybe too aggressive, and there is still the PoV to be played. Someone could still be blindsided if the PoV is used.....I can't imagine Steve won't at least try to put some sort of defense together to fight this. I wasn't worried about Angie self-evicting but I think that tweet was meant to be a joke. 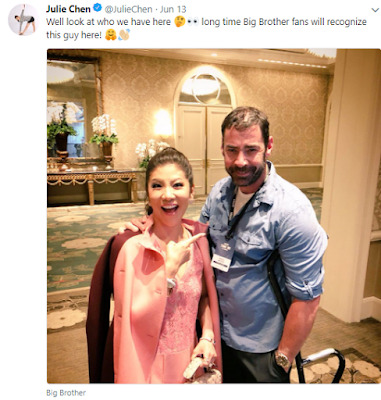 The competition set up sounds suspiciously like the way we started BB19, where Paul handed out eight "Friendship Bracelets" to the players who did not have to worry about being nominated. So maybe there was something similar this time, but in reverse, only giving eight players the right to compete for the HoH. There must be a competition to determine who those eight people are, right? With 16 house guests and a season widely reported to be 99 days, I'm still suspicious about exactly who will be playing the game this summer. 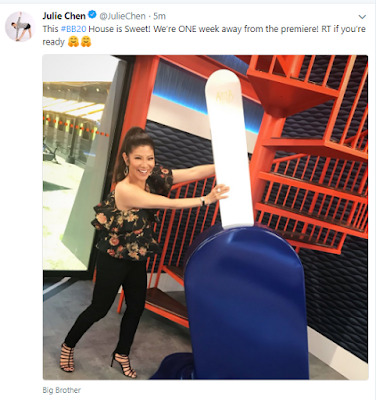 Because if we subtract 7 days from that, to account for the off-live feed week that is being filmed now, that would leave us 92 days left before the Finale. Not to bore you with math, but dividing 92 by 7 would indicate 13 evictions, which would take us down to the Final Three at the end of the game, which certainly sounds reasonable. But what about the Double Evictions? What about the two evictions that always take place during the next-to-last week of the game? 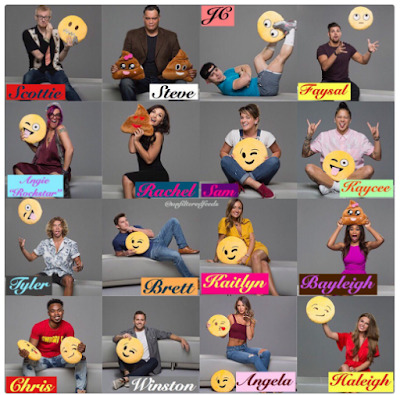 OF course, we might have a Buy Back type of situation this season, but I can't help thinking there might be some more additions to the cast at some point. 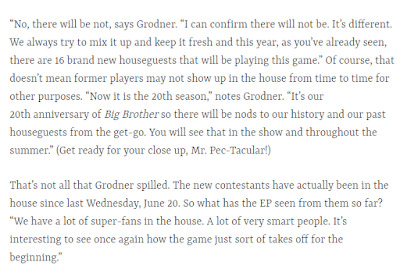 Allison Grodner did an interview with EW where she clearly states that NO VETS would be playing in the game this summer. But that doesn't mean some other folks might not come back. 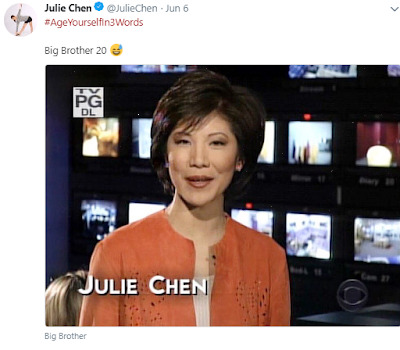 That doesn't mean we won't have an "Exes Twist", or some other blast from the past, since Julie has said each prior season of Big Brother will be referred to somehow this season. But here is Allison being quoted about the vets, and also saying what is happening right now is "interesting". Well, Allison isn't going to say it's boring, but she could have used a more exciting word to pump us up, right? It really is amazing how the show's fans around the world come together to spread the news. I can tell you that indications are that two of the BB teams are still in the game. The following photos were posted on June 21st, but the two BB teams you see in the pictures are still in the race, from various reports. So that is EXCITING news. The male team is a Survivor team, if you don't know. Brett and Chris from Millennials vs. Gen X. Chris is a former college football star, and Brett is a police officer in the Boston area. And this fan took these pictures on June 23rd, and you can see Victor is still smiling. 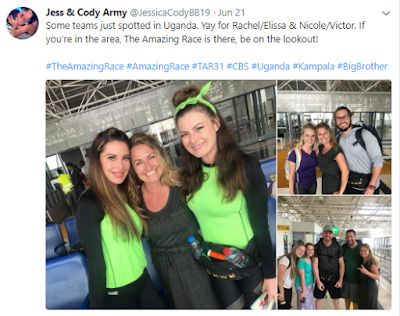 I think that Tyler Oakley guy is in another picture----he must be thrilled because I think he is a Big Brother fan and must be getting all sorts of inside info at the Race Pit Stops. (and also a TAR veteran, from the Social Media season, or whatever). (I didn't watch that one.) I think there may be another Social Media team still in the race, but I'm not sure. And I also think there is only one Survivor team still racing, but I may not have the most recent information, of course. And this Twitter account is the main one tracking all of the TAR spoilers, which they did last year as well. The twitter account they are retweeting here has a video of someone bungee jumping among all those huge rocks (not a racer, but an example of what the Racers must do). I can't even imagine doing that.....there would be new fears of slamming into the rocks, compounded by the usual fear of dying in a very unnecessary manner, relying on a big rubber band to save your life and limbs. 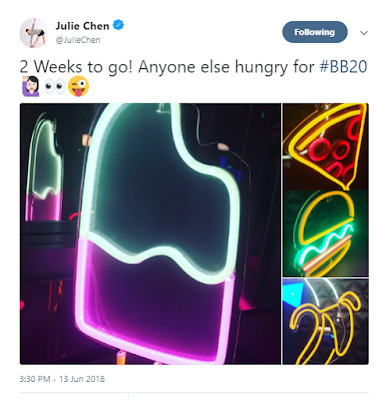 Julie has been trying to hype us up for weeks now, posting various pictures to get us all talking about the new season. She posted this picture with Eddie McGee, the winner of the first season of Big Brother. Eddie is an actor now and I remember Austen talking about him on the BB17 live feeds, saying Eddie was one of his neighbors. I didn't recognize Eddie here, so I had to look at Julie's twitter feed to figure out the mystery. 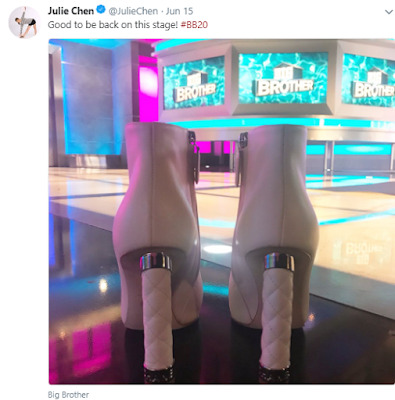 Julie also posted this picture of herself recently, so she looked a lot different during BB1, too. By the way, does anyone believe that Julie just "ran into" Eddie? 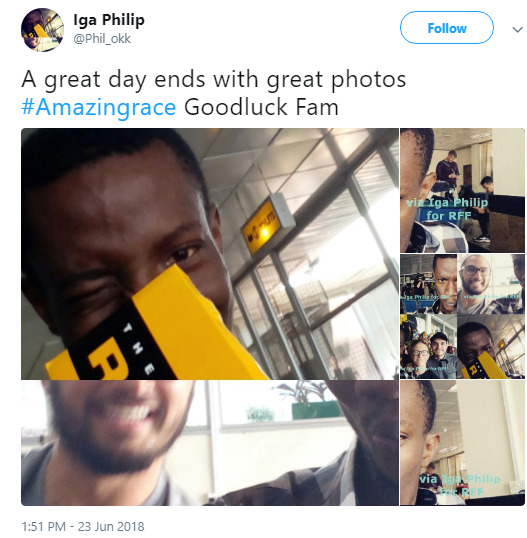 Nah...pretty sure he was taping something or planning some sort of involvement with BB20. 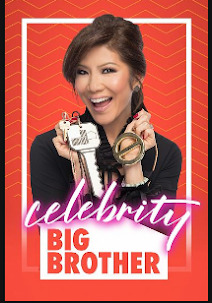 Not the game itself, but maybe a competition host or whatever they plan to do with all of the alumni who attended the premiere as audience members. I guess there is some sort of amusement park treat theme to the house this year. Usually the decor doesn't have much to do with the game though, although they do occasionally use the props in the house as part of some sort of competition. Like the "Call Paris" twist during BB18, for example. Looks like Julie will have the same stylist this season, too. 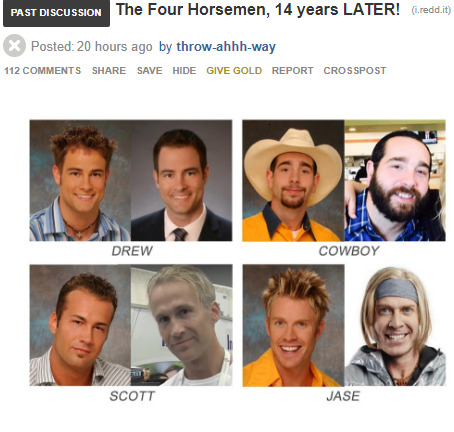 And speaking of people who have changed physically since their Big Brother seasons ended, take a look at The Four Horsemen of BB4. I'm not sure how recent the updated pictures are, but I find the changes in each Horseman staggering in their own way. Time is not a friend to everyone, now is it? Drew looks good but I think Scott is the most tragic. Totally tragic. I need to hear the voice coming out of that face before I can really believe it. Scott used to be a David Puddy type. Not anymore.